Yes, the Yankees are off to a disappointing start to the season. They lost their first two series to the lowly Orioles and Tigers. The Bombers have been decimated by injuries, which has put a strain on their strong depth. It's easy to feel like Kevin Bacon's character in Animal House, declaring, "All is well" despite a stampede all around. Still, despite a 3-4 record, it's not time to abandon ship. After all, we've only seen seven games, a paltry four percent of the season. After Thursday's win, the Yankees could be a strong week from erasing early-season panic. Here are reasons to be optimistic in the midst of a slow start. Sure, the Yankees couldn't keep up with the O's and Tigers in the opening week. However, the team still faces a winnable early stretch while the injury list potentially recedes. After playing in Baltimore this weekend, the Yankees head to AL West-favorite Houston for three games. Once that series concludes, the Bombers have just two games against 2018 playoff teams before May 30. While they also have two series with quick-starting Tampa Bay next month, they also have 17 games against the White Sox, Royals and Orioles before the end of May. The Yankees, therefore, can avoid getting their doors blown off by fellow contenders as they reach full health. Their matchups with the Red Sox are mostly back-loaded in the schedule, and an upcoming nine-game west coast trip doesn't include last year's division winners. The easiest reason for pessimism right now is the mounting injuries, making the 2019 Yankees look like the limp-to-the-finish 2014 Texas Rangers. However, the long-term prospects for those on the injured list are promising. Dellin Betances, CC Sabathia and Giancarlo Stanton are all expected back before the end of the month, as is potentially Aaron Hicks. Luis Severino is slowly progressing from his shoulder injury with a possible return early in May. Didi Gregorius hasn't had a setback in his Tommy John rehab. The scariest injury may be Miguel Andujar, who could lose the season to a labrum tear. Even if he returns, the shoulder injury could hamper his performance. The Yankees, however, have a fine backup in D.J. LeMahieu, though Troy Tulowitzki's injury keeps the team spread thin on the infield. With injuries to Severino and Sabathia, one may have expected the rotation to let down the Yankees in the early going. However, it's been the opposite. The starters' collective 2.71 ERA is the sixth-best in baseball. Yankees starters feature the league's eighth-best K:BB rate. They've held opponents to two or fewer runs in five of seven games, handing leads or ties to the bullpen. Masahiro Tanaka has looked like an ace. James Paxton had a superb outing, then overcame a weak first inning to keep the Yankees in the game Thursday. While J.A. Happ struggled in his season debut, Domingo German and Jonathan Loaisiga had promising outings as well. With a better offense and a strong bullpen backing them up, the starters should see more wins coming their way if they hold up their recent performance. 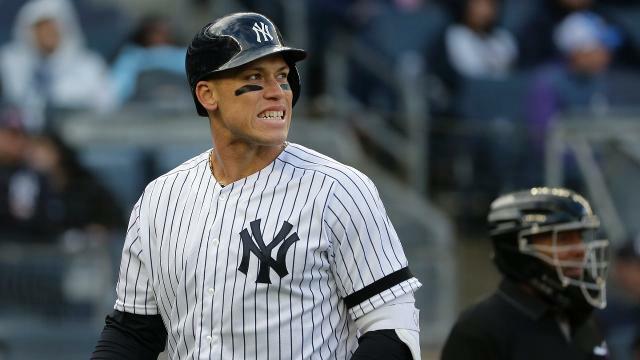 It's funny to say someone who had a .481 OBP entering Thursday hasn't hit like themselves, but that's where we are with Aaron Judge. He has just one extra-base hit, though his .286/.406/.308 slash line is respectable, albeit not what we've come to expect from the big slugger. Opposing teams pitching around Judge is the expectation, so even with less protection in the lineup, he should have a hot stretch coming on top of a fine start to the year. The Yankees certainly need more offense around Judge, and they found that Thursday with Gleyber Torres and Gary Sanchez. The Red Sox are 2-6 on a brutal trip out west. The Astros are at 2-5. The Indians just reached .500 at 3-3. All of which is to say: It's April. Maybe we'll see a surprise AL playoff team or two, but it's more likely that the top contenders just had a bad week and will emerge in the coming weeks or months. The Yankees, for all their issues, have a positive run differential and have been in every game. They're just two games behind the division lead and it doesn't take much to imagine them reeling off series wins against bad teams, even with a beleaguered roster. A slow start has not put them in any type of insurmountable hole. Seven games is hardly enough time to judge this team, and good vibes should return to the Bronx shortly.